Tonatzin Guadalupe has been adored through many titles throughout time. Many of her titles come from goddesses associated with Tepeyac Hill in Mexico, a place in which she is said to have appeared. Our Lady is implored through prayer for almost any reason especially by the Mexican people who consider themselves the children of the Virgin. She is well known as a protectress of families, one who keeps mothers and the unborn safe and spouses faithful. 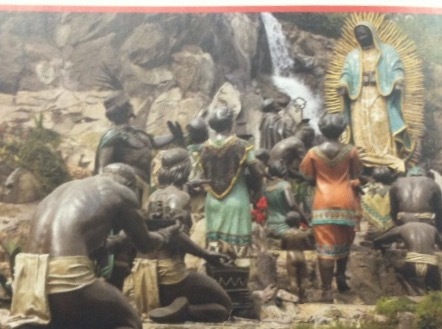 The Virgin of Tepeyac is a favorite of many in the Americas including Catholics, pagans, brujas, and santeras. The prayers included below come from various traditions. "Remember, O most gracious Virgin of Guadalupe, that in your apparitions on Mount Tepeyac you promised to show pity and compassion to all who, loving and trusting you, seek your help and protection. Accordingly, listen now to our supplications and grant us consolation and relief. We are full of hope that, relying on your help, nothing can trouble or affect us. As you have remained with us through your admirable image, so now obtain for us the graces we need. Amen." 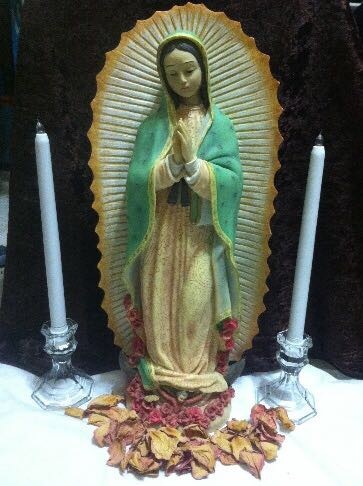 Traditional altars consist of 2 long candles, a candle holder, a votive candle, bowl for holy water, incense and a Guadalupe statue on dresser covered on white cloth. A simple altar consisting of just a candle with Our Lady’s image can also be used. Candles with a lovely floral fragrance are best suited to honor her. Tonatzin’s associations can be incorporated into the decoration of one’s altar, magickal practices, or prayer to the goddess. Her colors are green, red, and white, colors depicted in her image at Tepeyac. Her sacred flowers are poinsettias like those found on her hill in winter, and castile roses such as those found in Juan Diego’s tilma. Cactus fruit, tomatoes, and chilies are sacred to her. They reflect the rich, red fertility of the womb, a reflection of our Lady’s motherhood. Cacao beans and corn are also used for this purpose. As such, chocolate is sometimes used as an offering to her. Copal is her sacred incense. Special foods are also eaten in her honor especially on her feast day. These include raspados, buñuelo, and tortas. A recipe for another dish, sopa de espinaca con codito, is included below under “Family Activities”. An important element of reverence of Tonatzin Guadalupe is the practice of divination, usually in the form of tarot readings. The most common deck used is the Rider-Waite, but any deck could be used. Some utilize traditional tarot interpretations and spreads, but there also some that are unique to magick and prayer to Guadalupe. In Brujeria, readings with our Lady’s guidance sometimes use names and interpretations associated with the saints. Prayer to and celebration of Tonatzin Guadalupe often manifests itself as a family or community event. Included below are some ways to engage more closely with Our Lady. They can be done alone or shared with loved ones. Boil spinach and macaroni separately, rinse and drain. Brown minced onions in oil and add tomato sauce. Stir and let simmer for 2 minutes. Add broth. Salt and pepper to taste Bring the mixture to a boil and add macaroni. Then add the spinach and simmer for 5 minutes. When ready to serve, add butter if desired and let simmer again for about 5 minutes. Rose petal beads have long been made into rosaries and jewelry to honor the Virgin. Beads can be made with flowers from one’s garden or flowers received to mark special occasions. Benet, Sula. Festive recipes and festival menus. Abelard-Schuman Limited, 1970. Cunningham, Scott. The complete book of incenses, oils, and brews. St. Paul, MN: Llewellyn Publications, 2002. Devine, Mary Virginia. Brujeria: A study of Mexican-American folk-magic. St. Paul, MN: Llewellyn Publications, 1982.